At M G Appliance Services, we provide excellence in service to a wide range of appliance types and brands. We are the factory authorized service agent for Crosley, Danby, Electrolux, Frigidaire, Gallery, Gibson, General, Icon, Kelvinator, SmartChoice, Tappan, and White-Westinghouse. Our office personnel strive to meet your needs while assisting our factory trained in-home service technicians to accomplish their tasks. Our team will take the time necessary to correctly diagnose your appliance problem, and then repair it quickly and efficiently with as little disruption as possible. While doing this, we use the best in parts and products, thereby ensuring that every job is guaranteed to last. We repair and install fridges, clothes washers, gas and electric clothes dryers, ovens and stoves, air conditioners and dehumidifiers. Starting as a small family owned business, we have built it into one of the most recognized service companies in the Ottawa area. One that is proud to say our family is now in its 4th generation as a service provider. Throughout our 55 years in business we have endeavored to offer the best possible service at a reasonable price. We offer a quality of service that allows our customers to have confidence in our ability to resolve their appliance problems. 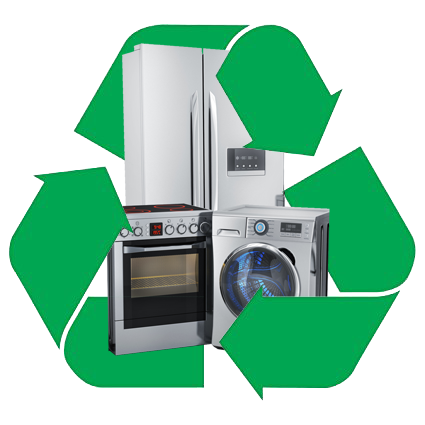 We also like to share news, answer FAQs and provide information about recycling your appliances. As our motto says: “We Take the Gamble out of Appliance Repair“. Contact us for more information. Refrigerators and freezers use Freon and other chlorofluorocarbons as a refrigerant. These cooling agents have been identified as ozone-depleting substances and must be safely drained from refrigeration units by a trained technician. When disposing of any appliance containing refrigerant, it must be removed and handled in a specifically regulated manner. The technicians at MG Appliance Services have been trained to dispose of these harmful refrigerants by using special methods and equipment. We remove and transfer the refrigerant so it can be disposed safely, thereby lessening any further harm to our atmosphere. Due to high demand and restrictions during cold weather, unfortunately we are unable to offer recycling of appliances during the winter months.